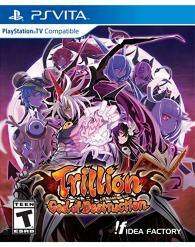 From Idea Factory, 'Trillion: God of Destruction' is the start of a new franchise revolving around demons and netherworlds. In this first entry, the game sees players taking up the role of Great Overlord Zeabolos, training those close to him to defeat a powerful god before he consumes the entire netherworld. 'Trillion' is one of the hardest games I've ever had to review, simply because there's so little like it. Originality alone doesn't carry a game, but it can certainly help, and if nothing else, the game is a testament to how experimental Japanese developers can be when given free reign. The publisher, Idea Factory International, describes the game as an SRPG, which isn't exactly correct, though it certainly bears hallmarks of the genre, having been developed by the man behind the wonderful 'Disgaea 4' and equally wonderful 'Guided Fate Paradox', the latter of which stands as one of the coolest JRPGs of last generation. Like those games, 'Trillion' is staggeringly complex, but presented in such a way that it easily becomes manageable. It's practically impossible to finish this in a single playthrough, but that's entirely by design. 'Trillion' will make you learn to deal with futility, it'll make you see every cast member die in a surprisingly gut-wrenching manner, and only once that's done will it give a chance to try again, overcoming everything that makes first runs so harsh. The reason for this design all ties into the game's plot. A god called Trillion (because he has that much HP, naturally) is devouring the netherworld piece by piece, killing millions of demons without a thought. When things get particularly desperate, Zeabolos, a Great Overlord, goes in to fight it himself, seeing his brother killed moments before he is swiftly dispatched himself. He's given a second chance at life by a mysterious woman named Faust, who gives Zeabolos one last attempt to defeat Trillion before she takes his soul and he's killed off for good. Unfortunately, as his body is almost irreparably damaged, he can't defeat Trillion himself, and must give his power to one of seven overlords, all girls from his family or close friends, and train them from scratch to save the netherworld. It's a surprisingly grim story, really. 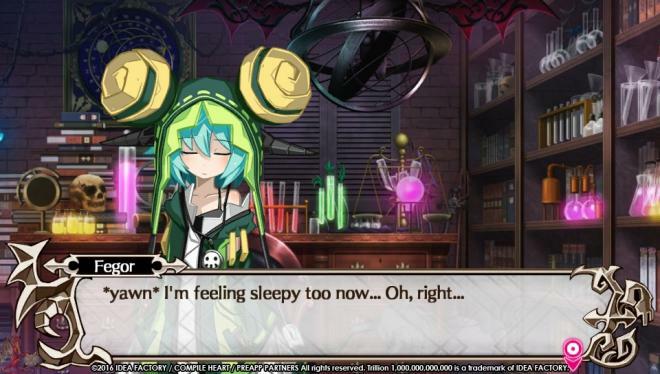 It becomes quickly apparent that one of these girls won't be enough to kill Trillion, and that the best outcome will see each girl shave off a bit of Trillion's health before being slaughtered, only for the next girl to carry the torch until one of them either kills him or the whole netherworld is destroyed. It nicely ties into the core loop of the entire game and can get surprisingly compelling, given just how apparent and major the stakes of it all really are. Gameplay is divided into two distinct parts, training and combat. Training revolves around being given a certain number of days until Trillion's next attack, and tasks players with allocating each day to a certain activity that can consist of raising stats, socializing, running through basic dungeons, and mock battles at the end of each week. There's no huge amount of interaction here, with the majority of it boiling down to digging through menus, but it's remarkably compelling, and planning out exactly which stats to focus on, as well as making sure your character of choice doesn't get fatigued keeps things interesting. Once Trillion shows up, it's time for roguelike-esque combat, which means slowly walking up to him on a straight road while dodging attacks he throws out as well as the underlings he summons. 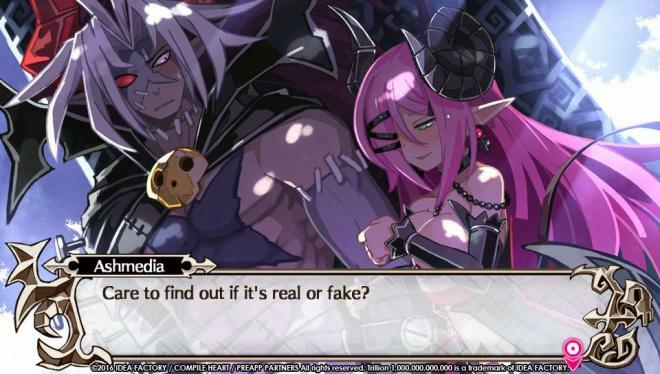 Additionally, Trillion also slowly advances down the same road as the player, and once he passes a certain line, the current overlord controlled by the player will immediately die. The game gives a few concessions to make things easier, and with the game being grid-based and turn-based, there's plenty of time to calculate every single step. 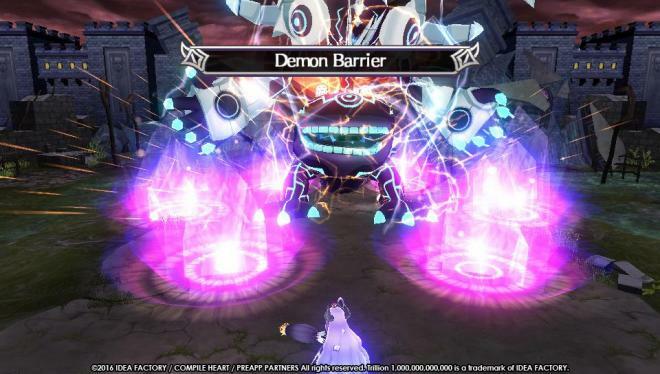 Trillion's attacks are telegraphed, thereby providing a chance to escape damage zones unscathed, but these battles are also extremely difficult, asking players to learn exactly how Trillion will act and how to best counteract his moves. Combat often feels more like an intricate puzzle than anything else, and just when I began to feel like I had things worked out, Trillion changed, bringing with him a whole new moveset and challenges that seemed insurmountable. 'Trillion' isn't just a hard game to discuss, it's absolutely punishing if you aren't willing to learn the way it wants you to. Once a character dies, a portion of their stats and experience go to the next character, leaving them starting stronger than their predecessor and with the advantage of knowing what works best against Trillion. This allows players to best allocate stats in a way that feels beneficial, but no matter how hard I struggled, it seemed unlikely I'd ever beat Trillion. When I did win, it felt like it was by the skin of my teeth. So I dove right back into a second playthrough, with my characters already powered up to see if I could carve out a satisfactory outcome. It's why I ultimately loved 'Trillion' as a game. It's punishing, it's extremely difficult, but it constantly gave me reason to improve myself. 'Trillion' isn't a looker. Most of the game is spent in menus, and when in combat, it becomes a little clearer why the game so heavily relies on static artwork. The 3D models on the enemies and player characters are serviceable, but nothing more. There's a nice sense of scale in all of the Trillion fights, due to how huge his model is and how the player must attack individual limbs, but otherwise, it's not a pretty game. The character designs, however, are largely great. At its best, there's some enjoyable music here, but for the most part, it's a bog-standard JRPG soundtrack with one particularly bad battle theme that kept popping up. The voicework is largely good, with both English and Japanese acting, though the English never clicked with me. The sound design, however, is the weakest part, with enemies only having one or two sound clips that play far too often, leading battles to seem weirdly comical in a way that clashes with the overall tone of the game. Considering the entire game revolves around replay, 'Trillion' does a fine job of incentivizing second and third runthroughs. There are multiple endings, tons of missable events, and new game plus modes that feel absolutely vital to making the game work as well as it does.